About two hours before practice started there was a line of cars forming on Loudoun Parkway. With people arriving as early as 5:45am, the regular parking area was completely filled and police and Redskins staff were directing cars into a giant field a little ways down the road. By the time practice began, that field, the size of two football fields side by side, was completely filled with cars and the parking staff had to get creative to squeeze the remaining cars. Fans walked in droves the mile through the heat towards the new practice bubble that loomed in the distance. The team estimated that around 24,000 fans made the journey out to Ashburn to a free event put on by the Washington Redskins; Fan Appreciation Day. Fan appreciation day was an opportunity for fans to watch their favorite team practice for a few hours and then attempt to get autographs. More importantly, it was a way for the Washington Redskins to get 24,000 wallets into Redskins Park and make some money. 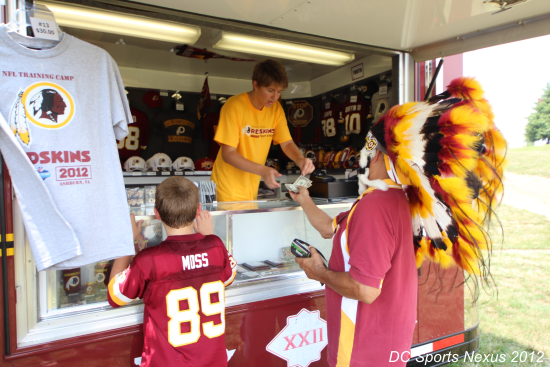 Before even entering the camp, there is a Redskins souvenir stand outside the gates. Less than 50 yards away inside is the Redskins team store, a giant tent filled with RG3 merchandise and Redskins apparel. Then 50 more yards down the hill is another Redskins souvenir truck. Three different places to get your Redskins merch. It seemed like every single family had a bag filled with merchandise that they purchased. Fans were buying footballs and jerseys in hopes of getting them signed by players on the team. The food trucks had lines the entire day and people were shelling out money for waters from the girl walking around with a water-tub. 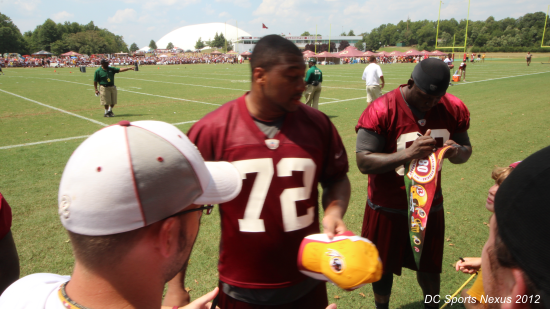 Corporate sponsors are also prevalent at training camp. Remax is the official sponsor, but the park also has several other big name brand sponsors. Chester Cheetah was passing out Lays potato chips, children were playing Coca-Cola themed inflatable games, and Papa Johns, Johnny Rockets, and Famous Dave's all had food trucks on the premises. But despite the amount of time it took, the miles traveled, the traffic, and the money spent, fans had a great time. Some would say the chance to heckle Rex Grossman & Graham Gano was worth more than money. But a chance to watch an NFL team up close and personal is a wonderful thing for fans and the players all stuck around making sure everyone got an autograph.